Tiffany and Lupus: Let's Battle Lupus Fatigue! Hello Lovies! Oooh do I have some goodies to share with you today! After keeping a "Lupus Diary" for the past 3-4 months I have noticed many different things regarding my diet. Contrary to what some of our rheumatologists believe, our diet DOES influence how our bodies feel with lupus! For example, if you ate too much candy, and did it repeatedly, you would get a toothache/cavity. So why shouldn't the same rule apply to us? There are many foods that can help reduce our lupus symptoms, but there are also foods that make our lupus symptoms flare up! The only way to know which foods are having what affect is to keep a "Lupus Diary". Keep track of what you eat and when, that way when you feel a pain, or if you're feeling good you can make a note of it and know what you ate that day! It's that simple! Now, I must be honest, I have NEVER been a fan of vegetables. I have always cringed at thee sight of greens, *chuckles* but I've created a new recipe that promotes eating healthy AND keeps your taste buds happy! Without further ado, I introduce you to SPINACH! Stop cringing, I saw you! Hahahaha! I promise your taste buds will love it, not to mention your body! Ever wonder what all the hype was about "Popeye the Sailor Man"? He was always popping a can before he did anything! Did you ever notice how HUGE his muscles were, like who has arms that size!!?? And take Olive Oyl for instance, she's practically paper thin, always a damsel in distress...I strongly suspect Lupus is to blame, she must not have heard about prednisone yet! *giggles* The only time I can remember her ever seeming strong is after a dose of spinach, which she totally got from Popeye! 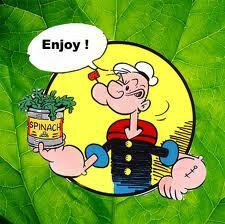 So, it seems that spinach is the key ingredient to building strength. Let's dig a bit deeper and really get into the nutritional value! Spinach is claimed to have more nutrients than ANY other food! Its available all throughout the year; its seasons being from March to May and from September through October. That is when it is freshest and best in flavor. One of the most important nutrients you can find in spinach is Vitamin K; which is necessary for bone growth and blood coagulation (normal blood clotting). One cup of spinach produces about 200% of Vitamin K for your Daily Value! There are so many reasons why adding spinach to your diet improves your health, to find out more visit The World's Healthiest Foods! For a complete and detailed breakdown; (charts included) of the nutritional value of spinach please visit Nutritional Data! Did you know that spinach is a natural anti-inflammatory food? 78% anti-inflammatory out of 100 to be exact! Not to mention that it's been proven to reduce risks of breast cancer, prostrate cancer, ovarian cancer,arthritis, and osteoporosis. Now we can get to how we can use spinach to battle 'Lupus Fatigue'. Spinach is rich in Iron, which is a necessity for all especially women. It's a much healthier source of iron than red meat because its low in calories and completely fat-free! Iron contains the enzymes needed for energy production and metabolism in our bodies; so it's no wonder that Popeye the Sailor Man was always popping a can before any vigorous activity! Special Note: People who suffer from Lupus Anticoagulant Disorder (NOT to be confused with Lupus SLE),Also if you are currently Coumadin or Warafin. Ask your doctor FIRST about spinach consumption, since those patients are often told to practice a diet that is low in Vitamin K.
I'd love to introduce you to "Tiffany's Organic Fatigue-Fighting Spinach Salad © "! 1. First, place the organic baby spinach into a mixing bowl. 2. Then, add about a tablespoon each of chopped garlic and chopped onion. 3. 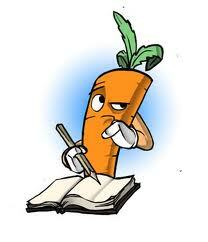 Next, take your organic carrot and shred it in slices into the bowl. 4. Toss some of your organic grape or cherry tomatoes into your mixing bowl. If you don't slice them, you can store your salad for more than 2 days. It's truly up to you. 5. Open your canned tuna and add that into the bowl as well. 6. Next, chop up your golden delicious apple making sure you DON'T add the core! 7. Take your hass avocado and slice it gently; the long way, so you have two even halves. 8.Now remove the seed and discard. Take each half and slice a cross hatch into it. Then simply poke the back of the skin in to pop out each piece! (see picture for reference) and add to the bowl. *Your organic meal is just about done! Now just to add your dressing options! 9. Take your lemon and slice it, after removing the seeds from each half, squeeze the juice onto the salad. 10. Add some feta cheese. Now toss, mix, toss, and mix! * You can now transfer your salad into a storing container to keep in your fridge. It stays pretty fresh up for about 2-3 days depending on whether you slice the tomatoes. After enjoying a serving of "Tiffany's Organic Fatigue-Fighting Spinach Salad © " I'm always ready to get a great start, battle fatigue, fight lupus, and spread awareness throughout my day! Do share any questions you have or come across, or pictures/emails/stories of mine or your own recipes & fatigue battling ideas! Feel free to add things you make like to the salad to make it YOURS; like mushrooms, almonds, grapes, etc..make healthy choices! We may not be able to control Lupus, but we CAN control the food we put into our bodies, and isn't it a great idea to have an awesome and tasty way of fighting lupus!? I think so! I leave you with a quote from one of my favorite Lupus Warriors, YUP! Popeye the Sailor Man! Stay STRONG my lovies! & continue fighting the daily battle that is Lupus. Remember you are NOT alone, there are people (even cartoons!) that are rooting for us to WIN! <3 Hugs & Lupie Kisses! yum I love spinach! I put it in scrambled eggs with cheese! so yummy! I like it in salads too, ooh yum! if you make a salad try this, add canned or fresh mandarin slices and raspberries and make a dressing out of a tablespoon of Miracle Whip (or Mayo) about a teaspoon of lime and fresh cracked pepper! Welcome to YUMSVILLE! The pharmacist in me needs to say, anyone taking coumadin/Warfarin or other blood-thinners should not eat spinach in large quantities or often because it will interfere with their meds. oh another thing! if you find you can't eat a whole bag of spinach and you're having to throw out slimy spinach, (EW) if you steam it and squish the cooked spinach in an icecube tray, you can add it to cooked foods when you want to add some! Once it's frozen, then pop it into a freezer bag. You can also save the leftover juice to use for soup instead of dumping nutrients down the drain! ok I'm done now, can you tell I REALLY love spinach? Thank you for sharing lovie! I will definitely be trying out your spinach recipe suggestions! Be amazed over how quick & easy that was to prepare and how fast it all went down! (and if you're not big on vinegar, it's good with just lemon juice & garlic). A Little Light in the Darkness!